Sometimes a nonprofit’s fundraising seems to go into a death spiral. Revenue isn’t just flat, it’s declining. The interventions attempted don’t work, and “big change” ideas won’t fly. Losses keep piling up no matter what senior management does to stem the bleeding. Firing the entire management team might be the only answer. Understanding why that is true could save your job. Sports teams go through these same cycles. In the sports world, there is a clear solution. Change management; get a new coach. My father, Jack Fulton, grew up a poor kid in Iowa during the Great Depression. His best friend was a guy named Bill Fitch. Bill lived on his block and was in the same class in school with Dad since starting kindergarten. Sports was the ticket out of poverty for both of them. They played baseball and basketball together in Cedar Rapids, Iowa through high school and college. Dad was the pitcher, Bill was the catcher. Dad was the center, Bill was the point guard. They were both inducted into the Coe College Athletics Hall of Fame, Dad in 1991, Bill in 1998. Bill went on to coach in the NBA. He was known as a “turnaround artist,” a guy who struggling franchises brought in when times were tough. He coached five teams during his NBA career, including the 1981 NBA Champion Boston Celtics with Larry Bird. He was twice named NBA Coach of the Year. His typical tenure with a team was four years; he would do what he could to make them better, then move on to another needy NBA city. Nonprofits can learn from the sports world. There are times when a management team can’t seem to find its way out of a ditch. What is it that keeps seasoned executives from finding solutions? Why is it tough for people to be “turnaround artists” for their own organizations? When you are in a job for a while, you tend to become conservative; you avoid taking too many risks. If you were playing basketball, it would be called “playing to keep from losing.” Behavioral economists would say you are suffering from “loss aversion.” Loss aversion was first identified by the renowned psychologists Amos Tversky and Daniel Kahneman. Loss aversion is a simple idea which has profound consequences. It turns out that people prefer avoiding losses to acquiring gains. For example, it’s better not to lose $5 than it is to find $5. How much better? The pain of losing $5 is about twice the pleasure of gaining $5. 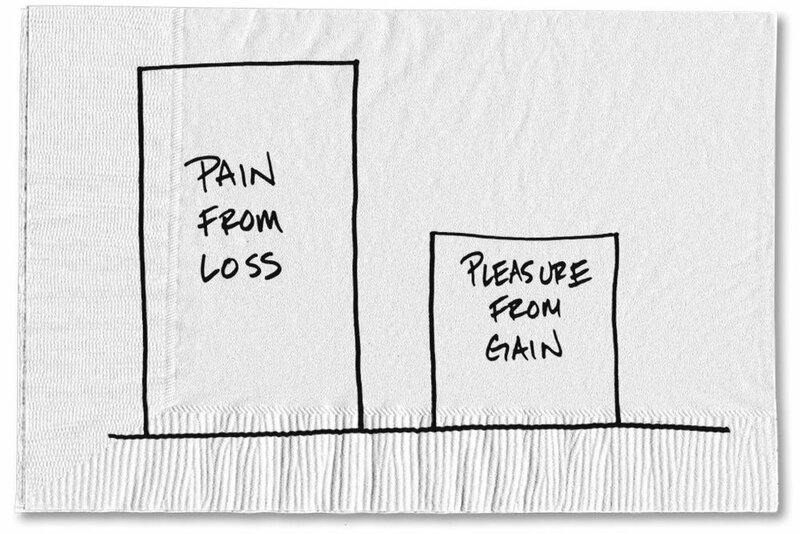 Said another way, losses are twice as powerful, psychologically, as gains. That tends to make people really, really cautious. Not what you need when you are struggling to break out of a slump. Not what you need when you have to innovate your way out of a crisis. There is one other cognitive bias that psychologists know makes change difficult, the “status quo bias.” The status quo bias is just what it sounds like, the tendency to resist change and prefer the current state of affairs. It happens all the time, with all kinds of decisions. Remember New Coke? In the mid 1980’s, Coca-Cola introduced a “new” Coke recipe that had a sweeter taste. People doing blind taste tests of the old and new recipes preferred New Coke to Coke Classic. However, even though people preferred the taste of the new recipe, Coke Classic continued to outsell New Coke – three to one. The status quo bias led people to stick with what they were accustomed to. We regularly see national organizations struggle with declining revenue from their programs. Money is spent on consultants for recommendations. Staff is brought in for Task Forces. Brainstorm sessions abound. But nothing substantive changes. Simply put, the team (unconsciously) would rather lose more revenue than risk a big change. The old team is reluctant to change unless they believe that the gain will produce much more – like, 200% more – than what they might lose. Starting to see why a turnaround specialist needs to come from the outside? Someone brought in from the outside isn’t going to suffer from these biases. They are less concerned with the potential for losses, because they aren’t the one who built up the bank. They aren’t affected by the need to preserve the status quo, because they haven’t been around to experience the status quo. They’ve never tasted the Coke Classic served up at your organization. We’ve all heard the expression “change for change’s sake doesn’t always equal progress.” But there are times when calling in a Bill Fitch is the smartest thing to do. Sometimes changing the coach is the best way to turn around the team.